I’m working on another blanket. Pattern is on Ravelry here. If you’re not a member of Ravelry, you can find it here. I’ve adapted the pattern to join-as-you-go because I’m not a fan of sewing lots of squares together. Gorgeous Girl was invited to a birthday party a while ago. We raided the fabric stash to make the gift. Fabric was bought in South Africa, so it’s at least five years old. In August I will have been blogging for 7 years. Over that time I’ve been blessed to meet people from all over the world and some of my blog readers have become true friends. When we got back from Cairns there was a pile of post waiting for us in the mail room (all of our post gets sent to Gorgeous Man’s work). Three of the parcels were for me (the rest was magazines for Gorgeous Man and some books from Grandma for Gorgeous Girl, but I digress). I’ve known Kate as an online friend since I started blogging. 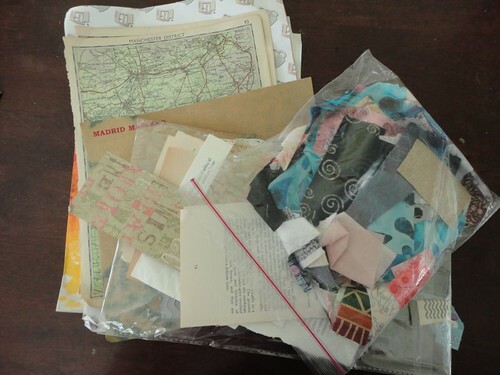 Recently she had a destash/clean out of some of her paper crafting stash and thought of Gorgeous Girl and put together a little package for us, lots of odds and ends for Gorgeous Girl to use in her paper crafting. (This is appreciated more than you would know as crafting supplies are hard to come by here and I usually have to plan and purchase for a few months at a time when we visit Australia). There was also a few goodies for me. I kept the maps and the text (I now have some french text to add to my pages – it will make a change from the Chinese history book I’m deconstructing!) She also included some fabric scraps. Most of these have gone straight into my strip bin to be added to my current strip quilt in process. Thank you Kate! Recently I won a prize on Cathi’s lovely blog. I’ve been reading her blog since 2006 and we’ve become friends, though we also haven’t managed to meet in person yet. We decided to risk sending the prize to PNG and test the postal waters. Cathi, the package had been opened and resealed, but the contents seem to be intact. I can’t wait to find some time to play with these lovely things. 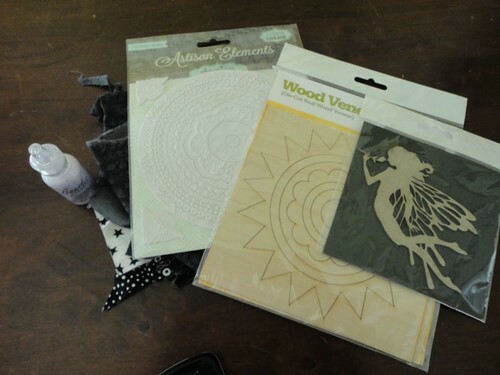 Doilies, wood veneers and perfect pearls! None of which I’ve had the opportunity of playing with before. Thank you so much. Cathi also quilts and so she also few in a few scraps of black and white fabric for me (I’m slowly collecting black and white prints for a scrappy log cabin quilt I have in mind) which was greatly appreciated. 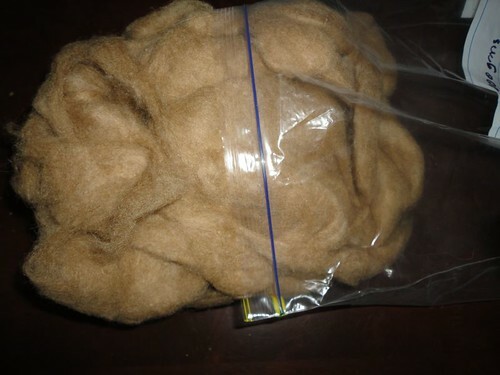 Last, but not least, a new Ravelry friend recently sent me some camel fibre to try. 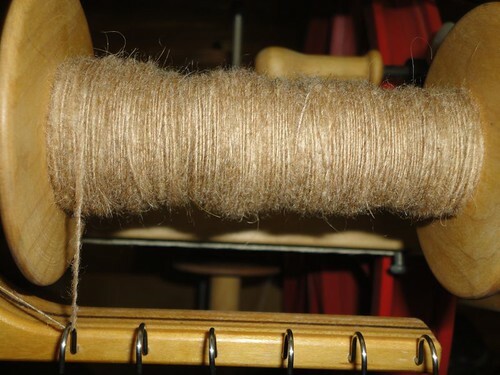 It went straight onto the wheel as my second Tour de Fleece spin. It’s told me what it wants to be when it grows up, but I’m going to wait until it’s plied to see if I need to exercise the power of veto or not. Thank you so much Mazz. You all should totally check out her blog. She’s in Australia and does amazing things with dyes from native Australian plants. I’m also in the process of test knitting a sheep for Yarn Miracle. Her designs are really well thought out. I think the big difference with Emily’s designs is that she makes use of directional increases and this produces a more professional look than many of the other patterns out there. This pattern is no exception. I’m hoping to get the head stuffed tonight and then move on to knitting the body. If you don’t for some inexplicable reason knit Emily specialises in the placement of pre-knitted companion animals. This shameless plug helpful information is to make up for the fact that due to being unable to download the pattern while we were away I am two weeks behind the rest of the test knitters (ahem).